Could I use any of this for group meeting this past week, in which my and Eric Corwin’s labs were continuing our exploration of good graph design? My wife and I brainstormed various other variables against which to plot the UFO data — latitude? education level? Inspiration finally struck: Sasquatch! 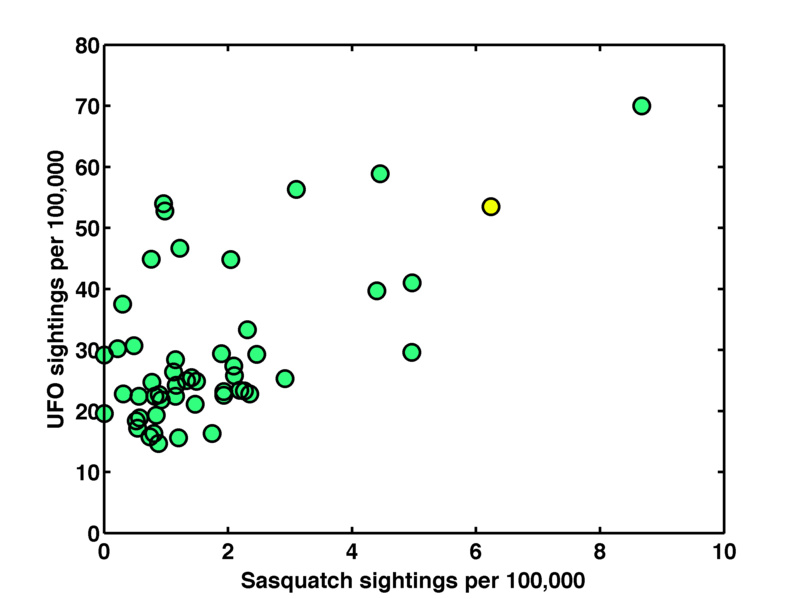 It’s hard to avoid the conclusion that Sasquatch is, in fact, an alien. If anyone wants my simple but unimpressive MATLAB function that colors points in a 2D scatter plot by the values of a third array, here it is. It would be fairly simple to add a colorbar, better hue or value sweeps, etc. Alternatively, you could pre-calculate colors and call MATLAB’s “scatter” function. 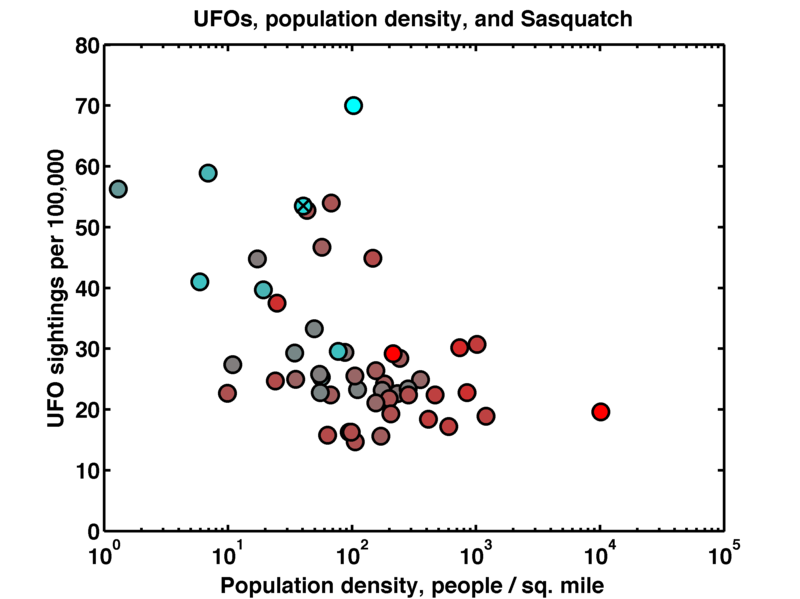 If anyone wants an Excel file with all the UFO, population, and Sasquatch data, it’s here. Good stuff! But the best correlation would be to cell phone coverage, I think, since overall sightings have fallen as carrying a cell phone has increased (the thought being that you no longer can just gesticulate wildly while saying ‘I saw a UFO’ if you have a camera on you). But areas outside of cell phone coverage can keep on “spotting” UFOs to their heart’s content. Good point! (It reminds me of http://xkcd.com/1235/ ). I have another theory, though, that the manufacture of cell phones and cameras requires rare metals from UFOs, fine hairs from baby Sasquatches, and bodily fluids from Loch Ness Monsters, so that secretly, high tech companies hunt down the last of these rare, tragic creatures, explaining their increasing rarity.